What a beautiful day for a Wedding in Chicago last November taking pictures at the Wit Hotel and Holy Name Cathedral on State Street with Ben Pancoast Photography. Teaming up together as The Photography Team with Ben and I has proven to be the perfect formula for the perfect wedding photos! 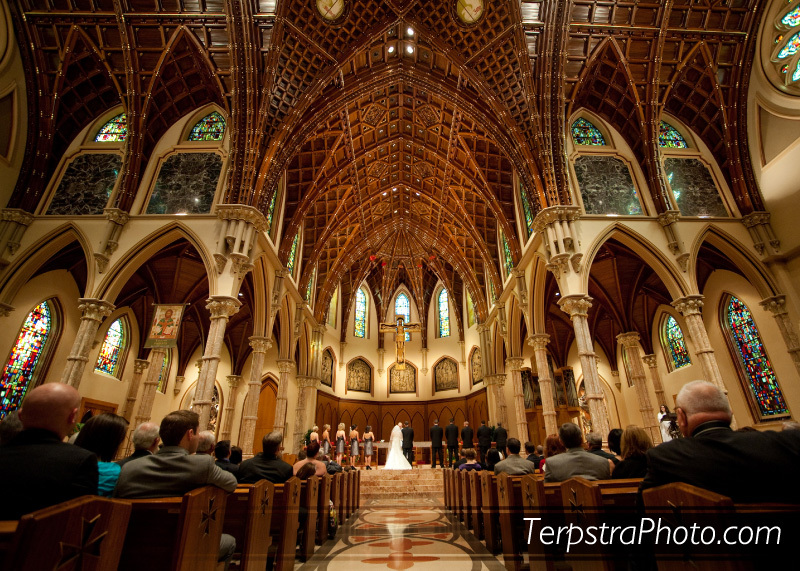 Shooting pictures in Downtown Chicago at the Holy Name Cathedral was AMAZING! Not only is it a great place for your wedding ceremony with such grandiose scale but the priest for the day was very understanding and conscious of how to get the best photos and coached the bride and groom through the ceremony perfectly. Another very interesting thing, this church burned to the ground leaving only the marble and stone just 9 months before this wedding and have been working feverishly to get it ready for ceremonies including Kelly and Chris’ wedding. After our ceremony at the Holy Name Cathedral concluded, we went to the nearby North Avenue Beach for photos of the Wedding Party. It’s a great view of the city there and has a great variation of locations for even a large wedding group. On our way back from taking photos at the North Avenue Beach, Ben brought us to Michigan Avenue for some photos in the middle of it all! The great thing about having a wedding at The Wit in Chicago is the contemporary and modern feel! It has an All-Chic Chicago Wedding Location feel. Aside from all the great photos during the reception, we had a great time creating cool closing shots at the end of the night.